FastNews - Template Blog Keren, Responsive, SEO Friendly, Magazine News Style, untuk situs web atau blog berita dan General Blog dengan banyak kategori. Template ini adalah tidak lain tidak bukan merupakan "cloning" atas Template Dynamic Mag. Silakan bandingkan. 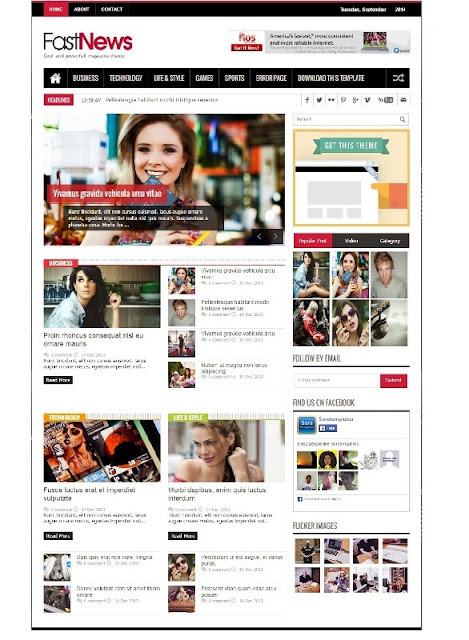 FastNews is a Ultra-Premium Blogger Template. It's features a jaw dropping beautiful layout with industry leading custom social and on site widgets. This template will enhance yours and your visitors Blogger experience. It is full responsive and functional no matter what screen size your visitors are coming from. It is also perfect for monetization and its compact body makes it a strong Adsense ready blogger template. Live Demo & Download FastNews - Responsive SEO Magazine News Blogger Template alias Cloning Dynamic Mag. cara mengatur slide dan lain-lainnya gmn gan? ?